This was the moment an amateur filmmaker captured the incredible spectacle of a storm dumping tonnes of water into an Alpine lake. 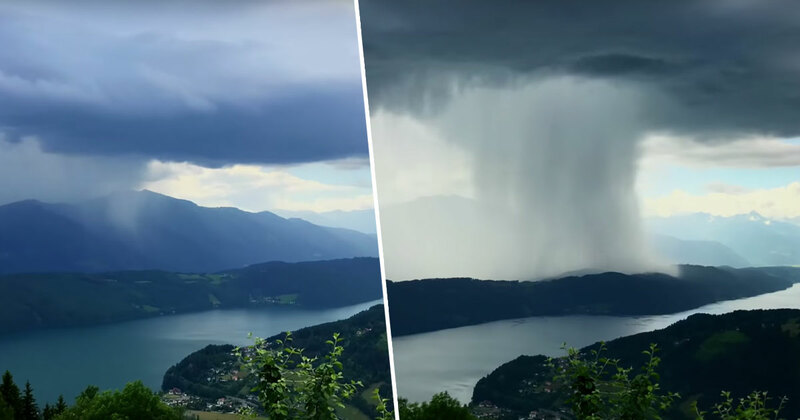 27-year-old Peter Maier, who is from Carinthia in Switzerland and works as a fitter in the energy industry in Basel, filmed the precise moment of the weather anomaly – known as a wet microburst – in a time-lapse video during a stay at the Lake Millsatt in Austria. Maier described the moment, which he captured from a hotel terrace, as a ‘tsunami from heaven’. One can’t plan on capturing such images. It was a lucky shot. The video soon went viral, racking up over 1.6 million views and 27k shares. However, some people who watched the video were convinced the footage was doctored, prompting Peter to post the original video. Both videos show a torrent of rain starting from the hills to one side of the lake, and then moving quickly across the water. A keen mountaineer, Maier says he always carries a bunch of cameras in his backpack to capture mother natures’ majestic moments. Speaking to the Press Association (via Shropshire Star) Peter said the footage was recorded over the course of 30 minutes by using the time. He also set up the camera on a piece of concrete for the timelapse but wasn’t even intentionally attempting to capture such incredible footage of the weather. Maier constantly carries five or six cameras with him at any time when he’s mountaineering in order to catch incredible moments just like the one above. A microburst, caught on camera by Maier, is a small-scale downdraft produced by a thunderstorm or rain shower. You can get wet microbursts or dry microbursts. Several fatal and well-known air crashes have been attributed to the phenomenon and training to become a pilot now goes to great lengths in order to teach people how to recover from microbursts.